In Mexico, Is Legalized Pot Just A Pipe Dream? : Parallels The Mexican tourism secretary said travel destinations like Cancún and Baja California Sur should legalize marijuana. 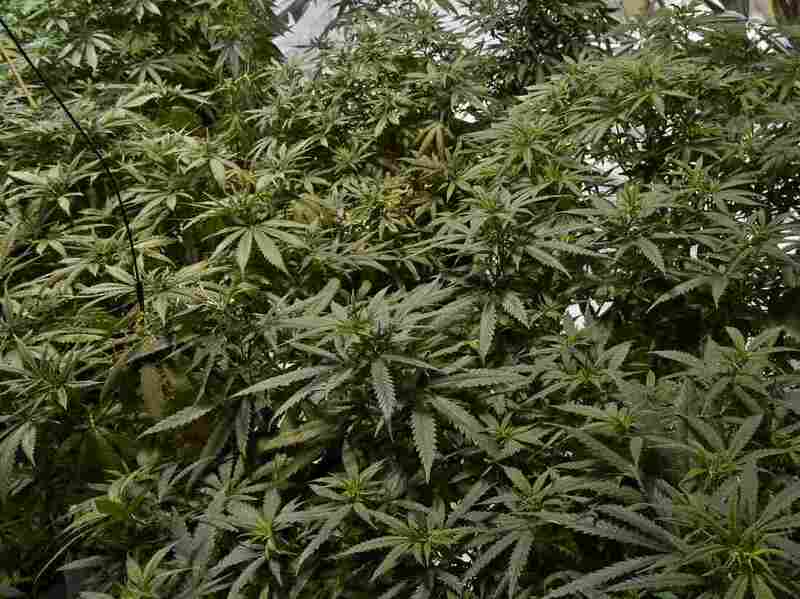 Marijuana plants are grown for medicinal purposes in a clandestine greenhouse in Mexico City in 2015. Mexico legalized medical marijuana in 2017, but recreational pot remains largely illegal. They were astonishing comments from a cabinet member made in the most deliberate of settings. At a conference in late January, Mexico's top tourism official told reporters legalizing marijuana would help combat an epidemic of violence that has enveloped parts of the country. "It is absurd that we have not taken that step," Tourism Secretary Enrique de la Madrid said. He said cannabis legalization should start in Baja California Sur, a state with hot spots like Los Cabos, and Quintana Roo, where Cancún is located. Both regions saw spikes in violence last year. The comments ricocheted across the Mexican media. Not only were they unexpected, but they also came six months before a presidential election in which a major debate is how to proceed with a U.S.-backed drug war that has contributed to Mexico's highest homicide rate on record. 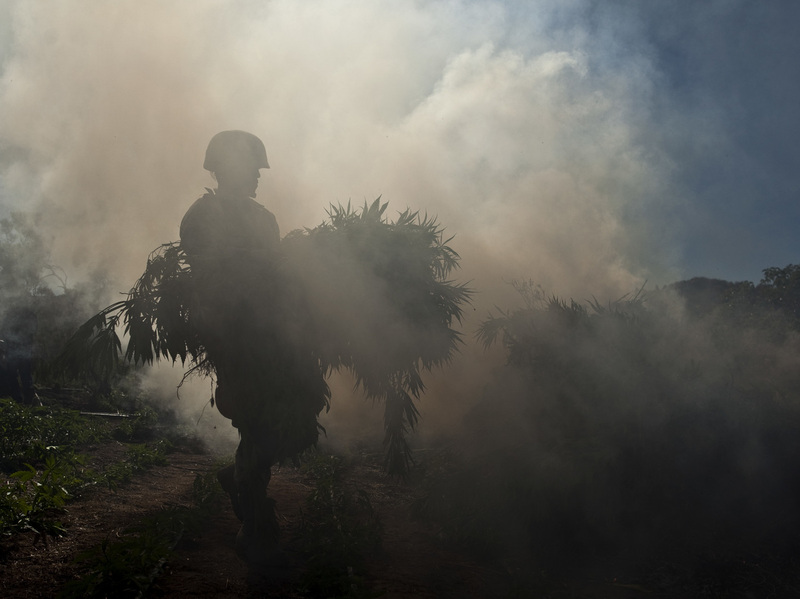 A Mexican soldier walks through a cloud of smoke carrying marijuana plants to a fire at an illegal plantation at the Sierra de Juárez, in northern Mexico, in 2010. The U.S. and Mexico have long cooperated in cannabis eradication efforts. "This is the first time that we hear a top-level official in office recognize that prohibition does engender violence," said Alejandro Madrazo, a professor in the drug policy program at the Center for Research and Teaching of Economics in Mexico City. "We shouldn't say, 'What did the secretary smoke?' We should take it seriously." Tourism Secretary De la Madrid later said the idea he was airing at the conference was his own, tweeting: "I want to emphasize that my opinion about marijuana legalization is a reflection in a personal capacity, based on analysis and study of the issue for many years. I am convinced that we should debate it, as part of the solution to violence and insecurity in Mexico." Quiero ser enfático en que mi opinión sobre la legalización de la marihuana es una reflexión a título personal, basada en el análisis y estudio del tema por muchos años. Estoy convencido de que debemos debatirlo, como parte de la solución a la violencia e inseguridad en México. De la Madrid could not be reached for comment. The idea of legalizing marijuana in Mexico is not new. Former Mexican President Vicente Fox called for decriminalizing the drug — once he left office. The proposal went nowhere. And as recently as 2016, President Enrique Peña Nieto proposed a bill to allow Mexicans to carry up to an ounce of weed, saying it made no sense for the U.S. and Mexico to pursue wildly different drug policies. The legislation stalled in Congress. Recreational marijuana remains largely illegal in Mexico. The country decriminalized personal possession of small amounts in 2009, but those prosecuted for selling or smuggling the drug face heavy penalties. In 2015, the Mexican Supreme Court ruled to allow people to grow pot for personal use, although the ruling only technically applied to the four plaintiffs in the case. In June 2017, Mexico legalized marijuana for medical and scientific purposes. Surveys say most Mexicans are wary of legalizing marijuana — but their opposition appears to be softening. An April 2017 poll by nonprofit group Mexicans United Against Crime and the pollster Consulta Mitofsky found that 56 percent of Mexican respondents opposed legalizing marijuana. That's down from 77 percent in a Mitofsky poll in 2010. One major — very major — change occurred in the intervening years: the United States' own shifting stances on cannabis. Most significant for Mexico, neighboring California legalized the sale of recreational marijuana in January. The market in that state alone is expected to reap $5.1 billion by 2019, according to research firms BDS Analytics and Arcview Market Research. "Colorado, California and the other states that have legalized marijuana have in some ways put the U.S. in a really awkward position," said David Shirk, a Mexico security analyst and professor at the University of San Diego. "On one hand, we are telling our friends like Mexico we want you have to have a zero tolerance policy on illicit drugs while at the same time we have let the camel's nose under the tent when it comes to marijuana." The U.S. and Mexico, both signatories of United Nations counternarcotics treaties, have cooperated in drug busts and marijuana eradication efforts for decades. "There is a significant contradiction in current U.S. policy that Mexico and other countries will begin to use as a basis for modifying their own drug policies," Shirk said. All that's to say: It seems unlikely Mexico will legalize marijuana in the near future. Then again, 10 years ago, who would have imagined that today one could go to a pot dispensary in nine states in the U.S. and walk out with legally grown strains like Granddaddy Purple, Bubba Kush or Super Silver Haze? As to whether legalizing marijuana in Mexico would reduce violence — that's up for debate. Estimates vary widely about drug cartel profits and the potential blow posed by legal pot. A 2010 report from the RAND Corporation in Washington, D.C., said legalizing marijuana in California would cut Mexican cartel profits by just 2-4 percent. A 2012 study by the Mexican Institute for Competitiveness concluded the cartels could lose 22-30 percent of revenue in three western states — Colorado, Oregon and Washington — that legalized marijuana. Cartels still smuggle weed into the U.S. but now there's been a reverse trend: officials seizing high-quality weed headed southbound at the U.S.-Mexico border. What's more, Mexican traffickers have shifted their focus to heroin and meth. Competition for those lucrative U.S. markets has helped drive up violence in Mexico, say security analysts and law enforcement. There are other factors at play, too. New criminal gangs have emerged — which has led citizens to form militias to defend themselves. Their battles have become a major source of violence in Mexico in recent years. But security analysts believe more of the violence results from Mexico's strategy to take down top narco bosses, leaving power vacuums and vicious battles to fill them. That's been especially evident following Mexico's extradition of Sinaloa cartel leader Joaquín "El Chapo" Guzmán to the U.S. in January 2017. Legalizing cannabis in Mexico would likely have a dual effect, Shirk said: It could lead to an even bigger growth in the heroin and meth markets, causing yet more violence. But it could also free up Mexican law enforcement to focus on combating harder drugs, as well as preventing and solving violent crimes. "The overwhelming resources of the state are going to prosecute poor, uneducated, dark-skinned males who possess marijuana. By de-emphasizing their criminalization you would release major government resources which could be used to prosecute serious crimes like homicide and kidnapping," professor Madrazo said. But Alejandro Hope, a Mexico security analyst, said police resources have already been redirected away from marijuana crimes. "There are a lot of reasons for legalization — eliminating a source of extortion, eliminating police corruption. But reducing homicides is probably not a big one." While the push to legalize marijuana may take years to materialize — if ever — the tourism secretary's comments had an immediate impact in Mexico in one major way: the race for the presidential election in July. It instantly became a topic of debate, and all of the leading presidential candidates were asked whether or not they support legalization. So far, none has, including leftist Andres Manuel López Obrador, who is leading in the polls. Lisa Sánchez, drug policy director of Mexico United Against Crime, which supports legalizing marijuana, said she found the timing of De la Madrid's comments "shady" given the political context. Even so, she wasn't complaining. "The minister is providing the general public with the right arguments," Sánchez said. "The public debate about this is going to happen sooner rather than later."